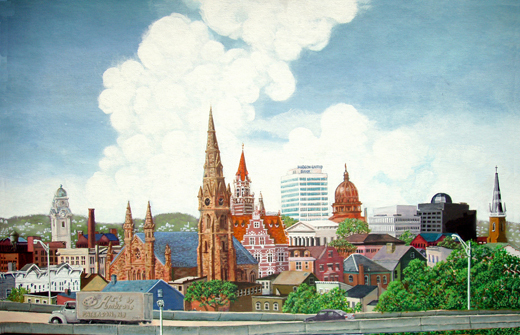 By request of my biggest fan and best promoter, son John Jr., I am posting a thumbnail-size image of my popular painting, “Spires and Steeples” a.k.a. a portrait of the city of PATERSON. This painting was a long-time ambition of mine. When my kids Lauren, John Jr. and Danny were growing up we spent countless hours in and around Paterson, at the famous Passaic Great Falls, at clubs and a cafe in the Italian section on 21st Avenue, at the Paterson Museum and—above all— in a wonderful park on Garret Mountain from whose lofty heights one could take in a vast panorama of the once-great city, now in a state of decay. At the foot of Garret Mountain is Route 80 which runs all the way from California to the George Washington Bridge. It was the view from Route 80 that provided the best view of Paterson with its smokestacks, church steeples, and many towers—truly an architectural treasure, oddly unique and out of character for a decrepit post-industrial example of urban north Jersey. The actual painting is 24″ X 36″. A limited, numbered series of 100 signed prints, 12″ X 18″, in an inexpensive black frame are sold for $49 each, and were quite popular when they first became available, and a few are still remaining for those interested.